For those of Unity 42 and beyond who are not aware, I am part of a side project. I had a musician friend come to me wanting to write a sports anthem and thus started a new project. I can say that don’t kick the baby is smart advice, but Don’t Kick The Baby is also the name of the band or rather the project. What did we do? We wrote a soccer (football for our worldview friends) anthem. It’s called Go Get The Goal. Much like what I did for Do You Want To Play, we did numerous versions for different leagues. So far we’ve covered the US, England and Australia. Coming soon we’ll be doing versions for Latin teams, and then we’ll be going after many more languages and countries. Our goal is to cover the world with a soccer/football anthem. As of right now 4 of the 7 albums we’ve done are on iTunes and Amazon. Later this week should see the other 3 being released. We’re excited. We’re so excited we have a Twitter handle and an official website as well. They’re still in their early stages. We’d love it if you’d follow us on twitter and tweet about us as well as finding us on Facebook, spread that gospel of soccer. It’s said that Don’t Kick The Baby is smart advice, but the smarter advice is to get the song then go out and get the goal. You’ll be happy you did. We’ll be happy you did. I’ll be happy you did. It’s a super win situation. In the past year I’ve been approached by other artists to start producing them. Obviously it’s rather flattering to have other musicians come to you and ask you for your abilities to help them with their career. One such artist is Calysto Bourne. Calysto creates deep relaxing music. The kind of stuff that is used for getting centered and relaxed. I have now produced three CDs for this budding master of the relaxation and chant genre. The first was a combo that contained 7 different popular chants in 7 different keys. Pretty unique idea I thought. It’s on iTunes and Amazon. Then came a slightly more ambitious project called Deep Om Tara… Which was a lengthy 1 hour track. The idea behind it was to create a way to escape the outside world, find some inner peace and calm and relax. I think I helped him achieve that goal. Like the first release, that is also available on iTunes and Amazon. Our 3rd adventure into the studio has yielded yet another 1 hour deep meditation track. 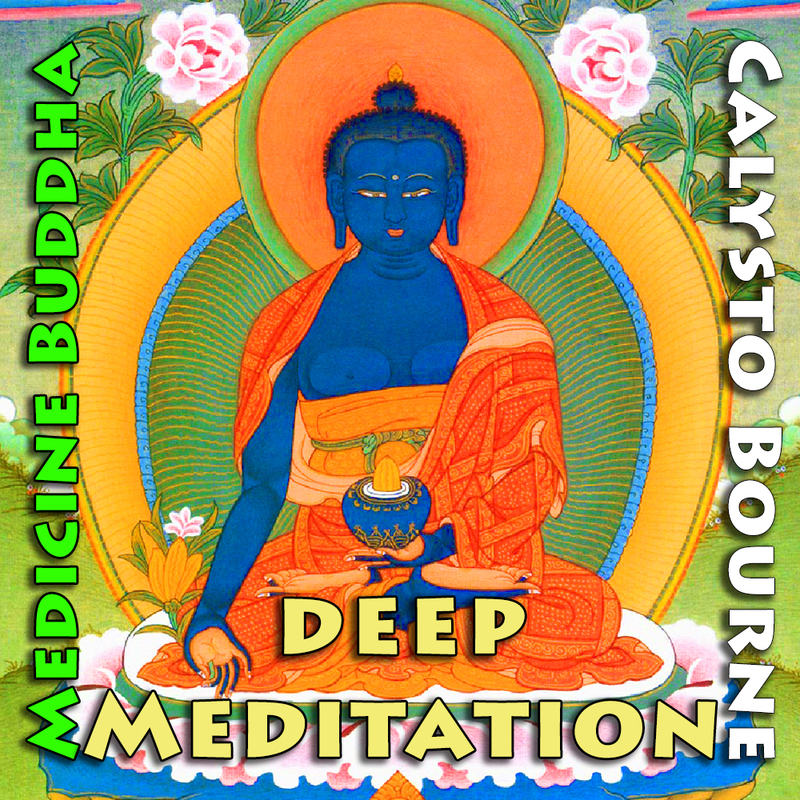 This time around it’s Deep Meditation Medicine Buddha mantra. Like the Om Tara it’s a 1 hour track that is designed to wisk you away to your inner peaceful self. There are key changes and tempo changes to facilitate getting into an even deeper state of relaxation. This release is now out and available on iTunes and Amazon and your other favorite digital stores. Thus if you need some real time away from the world, I can strongly recommend all of Calysto’s releases. Of course I’m biased as I produced them, but hey, I wouldn’t be telling you to get it if I didn’t like it myself. Calysto really knows how to create some great deep relaxing music and I’m happy I had a hand in bringing it to the world. Stay tuned… another announcement of a side project I’ve recently started is coming. Unlike the recent story that graced the pages of the SESAC Magazine, this interview with the Park Record is one I haven’t forgotten about. Mostly because I sat with Scott just last week. Based on that and him telling me the story would run on Saturday it’s pretty easy to remember that it was recent. The best part is, it’s another write up that really went well. I may be a musician with a full plate, but I still enjoy reading a good article. The two highlights are the song voting and the Patrons of Music points that are being announced and are now open on my website. In order to vote on songs, you need to log in to my website here (in the upper right of the column to the right of here). Once you’re logged in, you’ll be able to see the “Voting” link in the menu. You hit that and bingo, you can listen to demos for the next CD and then vote on them. It’s a beautiful thing. For the Patrons of Music, I’m going the Kickstarter type route without using Kickstarter. The article explains why. Mostly because I’m wanting to cover all my bases beyond major investors. For the next three months: Happy When I’m With You now available for purchase. That’s right my movie-loving, audio hunting friend. You can now purchase the song you’ve been searching for from the movie Lucky starring Colin Hanks. The lovely, bouncy and foot tappin tune that plays during their honeymoon montage is available right here, right now! Click the little [ok, the kinda wide] button right now. That will wisk you to a special place that will allow you to purchase a higher quality version of the song than you’d find on other digital service sites. Hurry and get it now as the offer is going to expire in 3 months from the date of this posting. Not sure when it will become available again after time runs out. Grab it now!